The Alt: Eamon O'Leary, Nuala Kennedy, John Doyle. Courtesy of The Alt. As usual at this time of year, I'm heading off to the annual Folk Alliance International Conference, the world's largest gathering of the folk music industry and community. I'm flying to Kansas City, where I'll see everything from traditional fiddlers and ballad singers to old-time and Celtic bands to Singer-Songwriters, Americana artists, and contemporary Roots bands. There's a smattering of everything American, from Tex-Mex to Klezmer, a sizable contingent from Canada, and folks from all over the world. All told there will be over 3000 artists and industry folks in attendance, including composers, agents, managers, publishers, labels, buyers, promoters and archivists. There will be round-the clock music at official and "guerrilla" showcases on designated floors of the hotel. I'll be there as a representative of our national folklore archive, the American Folklife Center at the Library of Congress. Each year my partner Jennifer Cutting and I give a presentation about how folk musicians can draw inspiration from our archive. But this year, since it's Alan Lomax's centennial year, I'll be talking specifically about Lomax's collections. Jennifer will be on the archiving panel. We'll have a booth in the exhibit hall all weekend. And we'll also be running the Lomax Challenge Stage, a 90-minute segment for which folk artists from around the country (and Canada too), have agreed to learn a song collected by Lomax and perform it. Artists who have signed up include Dom Flemons, Roosevelt Dime and Melisande. We'll have performances in English, Spanish and French, of both well-known classics and hidden gems of the Archive. The Alt are one of my favorite Irish groups of recent years, and a nice corrective to so many bands who concentrate on high-speed instrumentals. Their focus is on the song tradition, with old ballads and love songs at the core of their self-titled album. These pieces are lovingly selected from unusual corners of the folk world: source singers such as Irish Traveler John Reilly and English laborer Henry Burstow, folk revival acts like The Halliard and Norma Waterson, and books like Sam Henry's Songs of the People all get a mention in the liner notes. Even if you think you know the song, chances are their combination of words and tune is a variant you haven't heard before, like their marriage of Reilly's words for the old Child ballad "Edward" with the English tune used by Nic Jones, or their use of an unusual text of "Banks of the Bann" with the tune used by Silly Wizard. 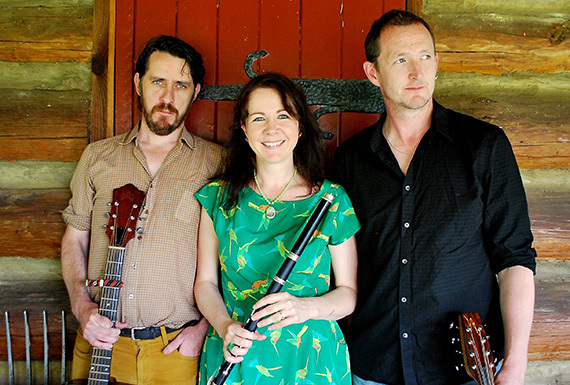 All three band members, John Doyle (Solas), Eamon O'Leary (Murphy Beds) and Nuala Kennedy (Nuala Kennedy Band) are strong lead vocalists and harmonizers, and Kennedy's singing is equally enchanting in English and Gaelic. Vocal harmonies, crisp guitar and bouzouki, and melodic hooks on the flute embellish the songs with arrangements painstakingly crafted to highlight each piece's best qualities. There's an almost unnecessary level of detail and variety, with harmonies and instrumental parts often changing from verse to verse, which dazzles you with subtlety rather than flash. In other words, the closer you listen, the better they are. And if you do like high-energy tunes, there's a couple of sets here reminding you that these folks are brilliant at that too. It's a truly great album. Find it here. Brian Miller and Randy Gosa. Photo by Darin Back. Courtesy of Brian Miller. Two of the Alt's members live and work in the U.S., and they recorded the album here, making them part of the long story of Irish music and song in America. 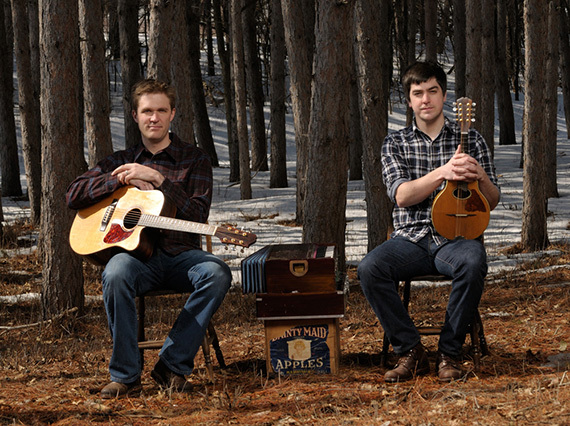 Another piece of that puzzle is provided by Brian Miller and Randy Gosa on their release The Falling of the Pine, which presents lumberjack songs from 19th-Century Minnesota, Michigan, and Wisconsin. Many of these songs were preserved in oral tradition to be collected by archivists and folklorists in the 20th century, and a good portion of them are on recordings in the archive where I work. Miller has visited our archive to hear cylinder recordings of Michael Cassius Dean and disc recordings of Warde Ford, both of whom had Irish ancestors and worked at logging in the north woods. Miller's research alerted us that about thirty of our cylinders from the early 1920s featured Dean, who compiled one of the first books of logging songs; the recordist, Robert Winslow Gordon, had labeled only a few of them, with the cryptic note: "Dean--Man." 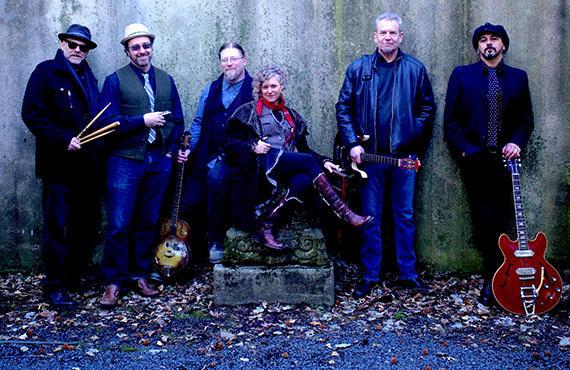 On the album, Miller's strong baritone is backed by his own guitar, bouzouki, and harmonium, and by Gosa's harmony singing, mandolin, banjo, mandola, and guitar. They do a sweet job on all the arrangements, creating a varied and satisfying album. Some of the songs are delightfully quirky Americana, from the Vaudeville piece "The Day I Played Baseball" to the grimly realistic yet somehow playful log-driver's song "Roll, You Drivers, Roll" (see the video below). One of the quirkiest is the historical ballad "The Jails of Buffalo," from the Irish enclave of Beaver Island, Michigan, which they learned from this Lomax field recording. Other songs are beautifully preserved versions of ballads you'd find in Ireland today, including "The Farmer's Boy," "Colleen Bawn," and "The Heights of Alma," which is a ballad about the Crimean War. (Meanwhile, their title track was recently also recorded on Pennsylvania rock band Marah's album of lumberjack and other mountain ballads, which just goes to show that you never know what will be the next trend in Americana!) Find the Album here. Spuyten Duyvil. Courtesy of Spuyten Duyvil. Spuyten Duyvil, "Make Me a Pallet on Your Floor." Lauren Sheehan and Zoë Carpenter: "Skinny Leg Blues." I'm sure I'll have a lot more music to share after the conference. And if you're in or near Kansas City, think about dropping by!